Sometime ago, we pondered the question, what's the difference between a blender and a smoothie maker? The answer seems to be not much, or certainly there's no real advantage to a "smoothie maker". This gimmicky device sometimes adds a tap to dispense the drink but that functionality is not especially useful and just creates another cleaning point. The difference between a juice and a smoothie is that a smoothie incorporates all the fibres of the fruit or vegetable to create a thicker drink, rather than extracting the juice and leave the pulp out. The Philips HR2094, in common with many of Philips appliances, cuts an impressive looking figure in any kitchen. Its aluminium casing with LED-illuminated buttons looking cool and modern. The device itself is powered by 750 watts of power, allowing it to make short work of almost any fruit or vegetables you care to challenge it with. It also crushes ice superbly - perfect for iced coffees or iced slush drinks. The 1.5L glass jar is dishwasher safe and also there's a detachable cleaning knife. 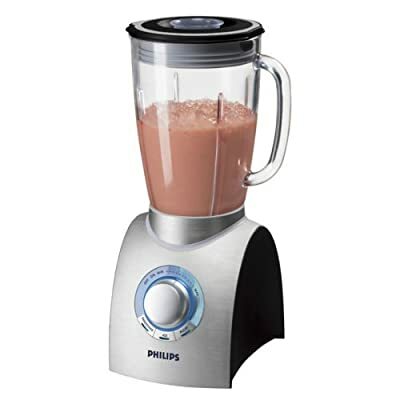 The Philips HR2094 Aluminium Blender is an impressive bit of kit which opens the door to refreshing healthy smoothies, and also can be used for a multitude of other purposes such as soups and pulses. So if you want to create decent smoothies, all upi need is a decent blender.